My little fudge business gained me a ticket to the trade show on the Monday and I was really looking forward to it. Having a day free on the Sunday made one decision easy, buy a ticket for that. I headed for an early morning flight down to London and after getting off the wrong tube train (yep was going in the opposite direction) and on to the right one I was nearly at my destination. Thanks to Jon for keeping me right. I then quickly checked my bags in at the hotel and headed across the road to join the queue with a great deal of excitement. First stop was Alex at Mackmyra – good to say hello to a friendly face and a kind offer of keeping an eye on my bags while I disappeared somewhere was kindly appreciated. I got my guv’nor hug and it was a good un. Said hello to the lovely Kat and met the ever so talented Emily Chappel. 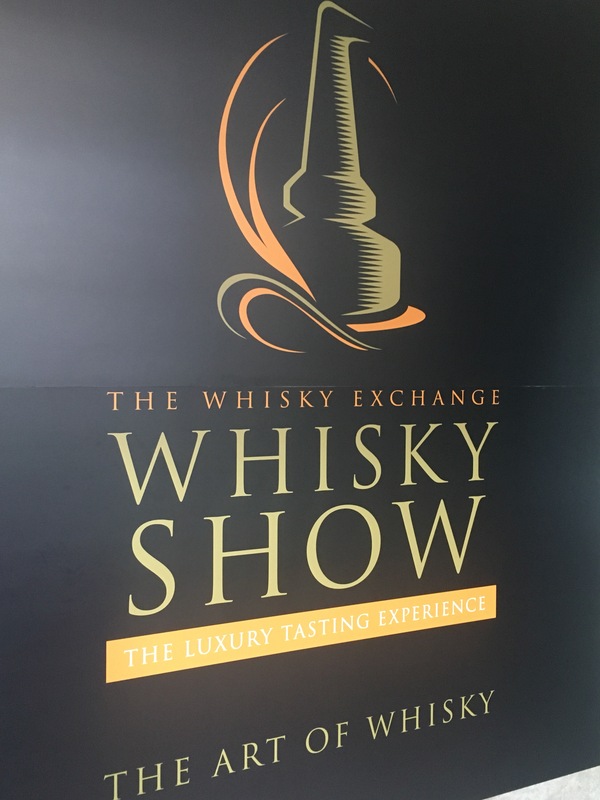 Lots of familiar faces and lots of faces that recognised me…especially if they spot the back of my phone 🙂 thanks Christy (Bruichladdich) I enjoyed the Black Arts….but oops I forgot to come back for the Octomore…silly me!! I had to head for the Elements of Islay stand to see what these little white boxes with hearts on contained having seen them on a photo. Yes of course these were boxes of Peat fudge and it was lovely to say hello to Myriam! I finally had the chance to meet and say hello to Angela D’Orazio from Mackmyra. A wonderfully energetic, open & friendly lady. I was lucky to have met Mark from Whiskycast who kindly gave me one of his Glencairn glasses, and I gave him a box of my fudge. Mark also asked me to say a few words for his podcast (and yes believe it or not I am quite shy..) So do feel free to have a listen to his Sunday show from the festival. Lots of interesting people. Then me…lol. So the day went a bit like this…whisky, whisky, whisky…oodles of whisky…and I didn’t fall over once!! (Ignore what Twitter says..) So many delicious whiskies passed my lips. Though I did nearly nod off in Wetherspoons as the clock tick tocked towards a late night…after a 4am alarm call it was bedtime. What struck me about Sunday was the camaraderie of the whisky community. So…yes. What a day! And guess what…there was Monday still to come. Monday had me arranging to meet Adrian, Jon and Steve for breakfast…then Jon had kindly enquired with Billy if I could join them for brekky number 2. The real one. The wet one. The whisky one. Upon arrival at Old Billingsgate Market we queued for The Breakfast Club or the Bloggers Breakfast… chuffed to bits to see my name Sarah…was in fact Fudge Queen. I liked that a lot. A thoroughly enjoyable breakfast of; an Irish Single Malt – 27 year old bottle by The Whisky Agency and The Whisky Exchange. Have to say I enjoyed this again having sampled it on the Sunday. We then moved on to the Frapin Cognac – 22 years old and again rather yummy. We finished brekky with a 40 year old Strathisla from Gordon & McPhail that was distilled in 1977 when I still ran about in short dresses and pigtails… a lovely chance to meet new friends…friends from Dramboree and some old friends too. And apparently I saved someone’s night… I won’t elaborate, but it was a nice story and I passed them another box of fudge for supplying breakfast. And thanks again Billy! More hugs. More fudge & goodies handed over to a friend and off downstairs for the trade day. Awesomely good Tomatin… deliciously divine GlenDronach Kingsman (sip of.) Tantalising Tomintoul 40 year old. Brilliant Boutique-y offerings… amongst others. I enjoyed spending time at the GlenDronach and Glenglassaugh stand too! And in case I’ve not mentioned you above it was lovely meeting Steve Prentice, meeting old chums Jon and Adrian. The lovely Dave Worthington. The cheeky Colin Dunn, always makes you feel welcome and David too of course. Lovely guys. Nice to say hello to Sorren again.. nom, nom…it’s all gone !! The Brum posse…Chris, Jamie and Amy. Who else? Mark (Whiskycast) and Angela D’Orazio and Alex at Mackmyra. Eddie and Amanda and other happy faces from The Whisky Lounge. Jeanine – great to see you there and meet your hubby. Hope to catch up soon. Also Andrew from andrews_share – nice to say hello and hand deliver a fudge order too! Team Bruichladdich were fab as well. And I think that’s a wrap.